The "chain" mode connects every new shape to the previous one. If you want to create a new branch in your diagram, you just deselect the current chain and select the new shape, which will be the root for this branch, turn the "chain" mode on again and then continue adding shapes. The "chain" auto connection mode is convenient for drawing flowcharts and business process diagrams. Sample 1. 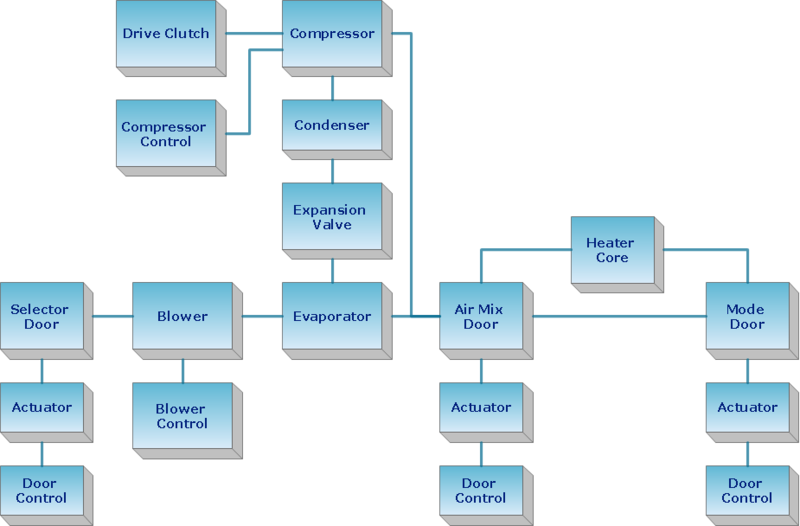 Block diagram - Automotive HVAC system. How should diagramming software work? The answer is - Fast and easy. "Tree"- mode drawing works like that. Just select objects in your drawing and press Tree or Chain button to connect all of them just in one click. Your diagram looks professional and it took only a moment to draw.